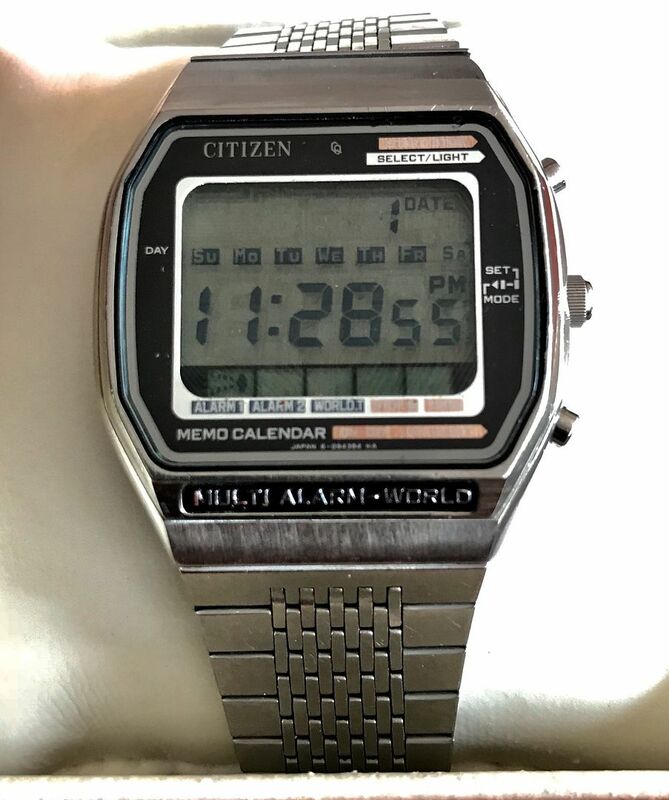 DWF - The Digital Watch Forum • View topic - Citizen Multi Alarm World digital ca 1983 resurrection! 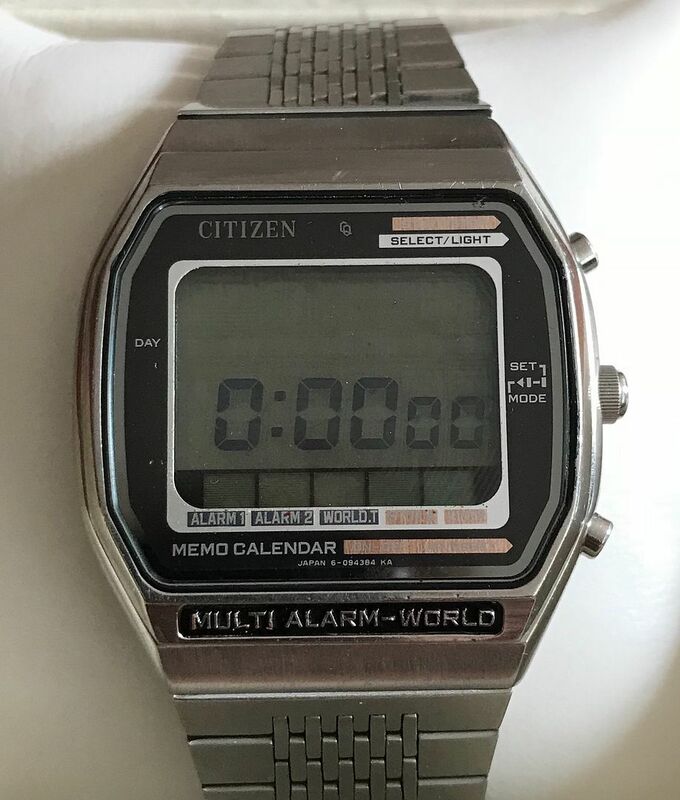 Citizen Multi Alarm World digital ca 1983 resurrection! Picked up two junked and very sad looking cases with modules. Some blue copper sulphate on all circuit boards. One case with missing stem and stem case tube. Another with smashed crystal (will get one cut). Stripped down both modules and selected the best of each. Nothing discarded as another module/case is on its way. I am hoping to get at least two running from what was 3 junked watches. 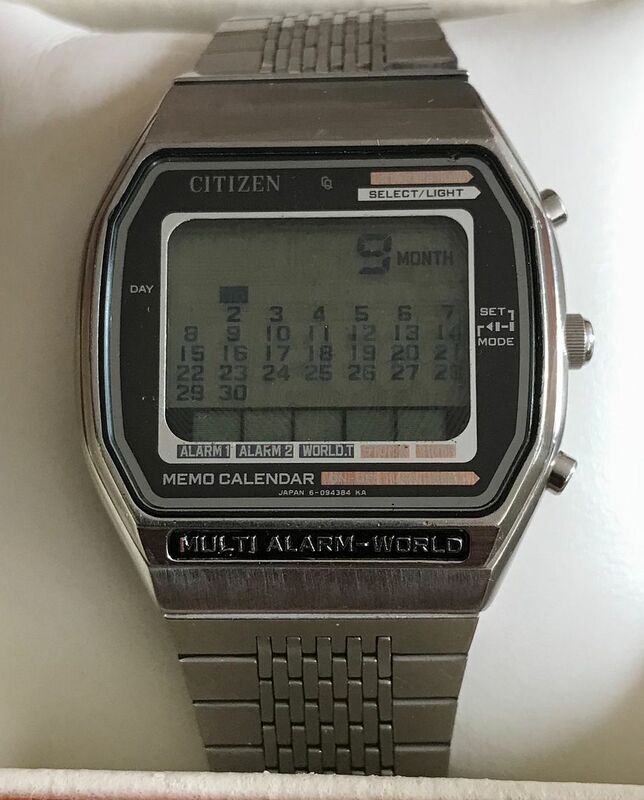 So if your digital watch requires the year for correct operation and the memory was too limited to include dates to 2100 then check out the above web site. Both modules had major failures and there are two separate circuit panels per module. The circuit panels are connected vertical via 6 tiny springs. I had to cut and use springs from watch strap spring bars. My stock had perfectly sized spring diameters in a gold colour like the missing originals (someone had been inside and obviously lost them). As well there are two springs which contact the case back and piezo that were missing. One module had corrosion badly on the stem setting mechanisms and levers. One had broken setting/contact lever due to the corrosion. Also missing was a contact mechanism which allows the push mode selection to function. The second module had a defective alarm circuit which I am trouble shooting. 1). functioning push mode selection. 3). All lcd segments functional (initially they weren’t). 4). All three sections (tripartite) of the case cleaned, derusted, polished and brushed to original factory standard. 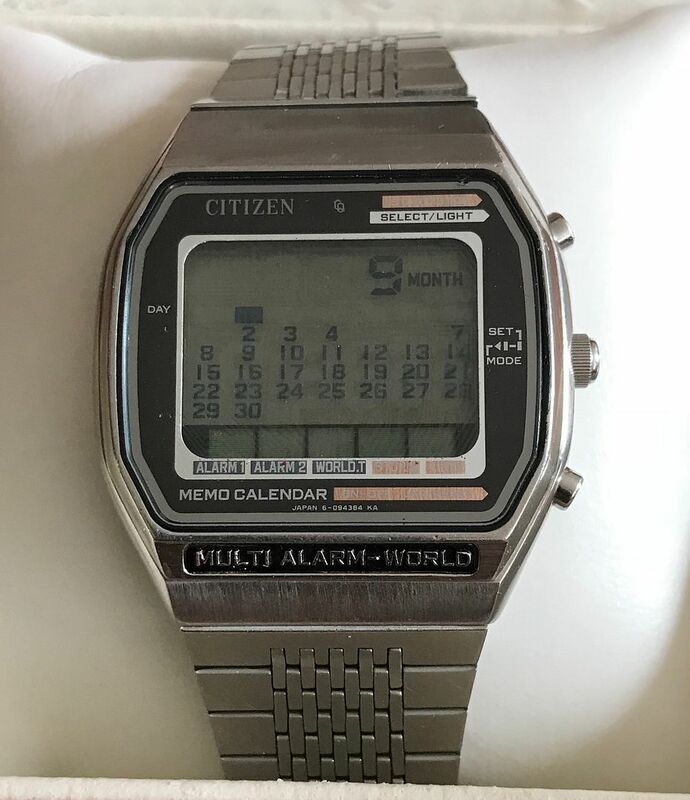 Calendar showing month and correct day association because I have selected year 1990 while setting the watch, also you will notice the 1 is not showing, it flashes to indicate the current date and the photo caught it between the flash. Here is the calendar with two memos set, one for the 5th and one for the 6th of September. These digits cycle on and off to indicate a memo is occurring on that date. You will notice the 1 is also blank but that is because it flashes (photo taken on Saturday the 1st) at twice the frequency as the memo 5th and 6th to indicate today’s date. 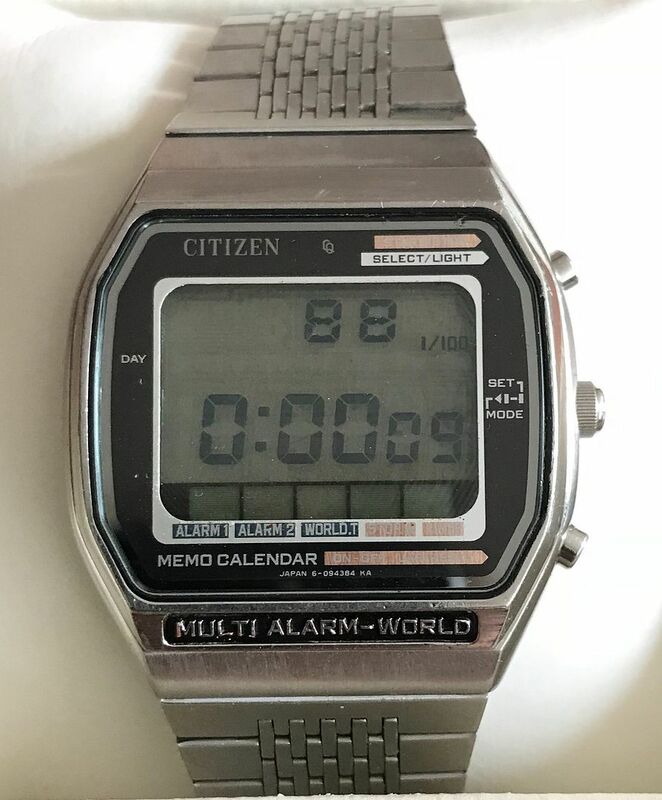 Only downside is the timer and stopwatch can not be run simultaneously. Probably due to the limited ROM available to control the functions. All in all a pretty impressive amount of functions packed into one watch! If anyone has a spare crystal or knowledge about a source along with the case crystal gasket and upper beagle to case gasket I would appreciate a line. Also any dead modules hanging around? 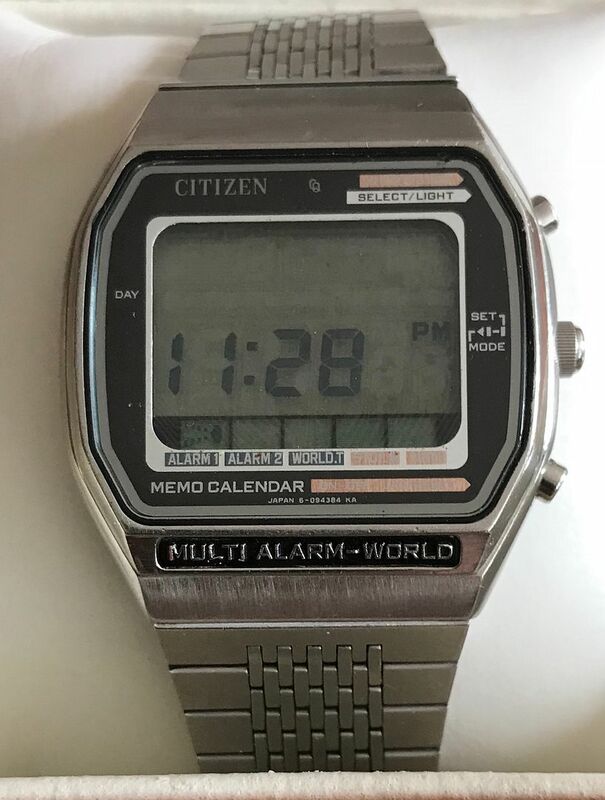 Re: Citizen Multi Alarm World digital ca 1983 resurrection! 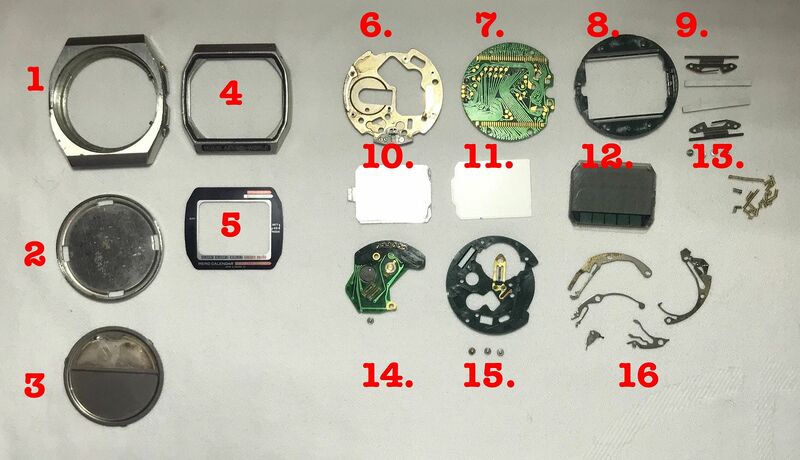 Here is a shot of the remaining parts left over from the combination to get one functional good looking watch. 1). Case part module holder missing case tube (centre piece). 2). Case back with sound holes for alarm. 3). Vibrating plate and piezo segment (chipped). 4). 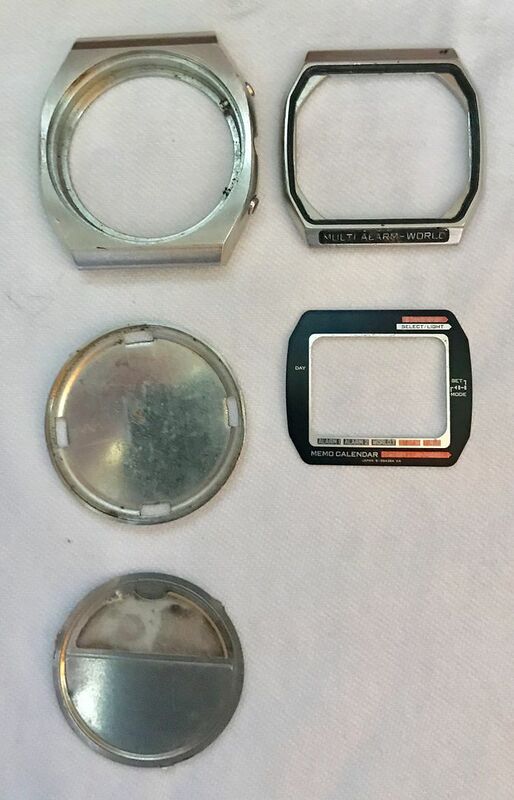 Top bezel for crystal (removed) and containing crystal gasket. 6). Main plate with setting levers/contacts removed (13 & 16). 7). Large PCA with LCD connection points. 8). Frame for LCD panel, reflector, light bulb projection lens and zebra strips. 9). Clamps and zebra strips for LCD panel. 11). LCD lightbulb projection lens. 13). Some springs made from spring bar springs. Needed 8 to replace missing set. 14). Second circuit board containing Quartz crystal, alarm beeper and controlling IC along with RAM. 15). Battery and final circuit cover. 16). Some of the setting levers/contacts. Missing: a corroded and broken setting lever, a broken and missing piece to the push mode selection mechanism, stem, stem case tube, crystal. Hopefully next module will help out sourcing these items. I hope to get another running. Circuit board #16 above has defective alarm circuit. Note the six tiny springs which contact the #7 circuit board. Had to cut thes from a spring bar spring, see #13. Also cut two longer ones to replace missing alarm contact springs. 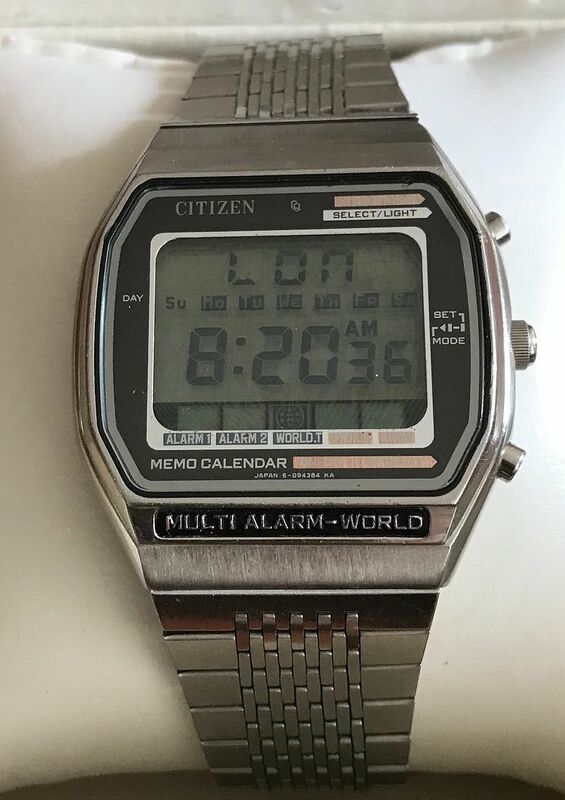 Thats whats called the Grail amongst Citizen digital watches, as far as Im concerned. 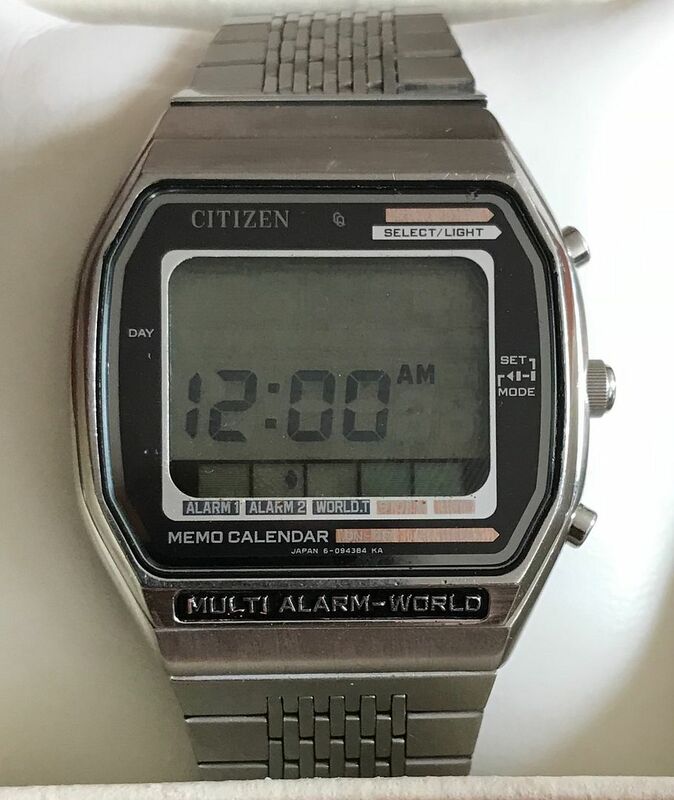 I have two versions of this model, one with a dark dial and one with a white dial. For the one with the white dial Im looking for a good display and a good stem/crown. I know (considering the nature of your thread) this is a bit the other way around.. Meanwhile, goodluck with your project! It took me a few years and several donor's to get one complete and the other allmost complete. These models do come by, so Im positive you will succeed! Edit: Aaaah, sorry I misread: you DID succeed! Very nice! Yes success, minor problems. I used two to create one. The functioning watch has a very low volume beep and I am hoping it is due to the cracked piezo buzzer. Both rear cases had broken or cracked buzzers. The second problem is the display is dark. Typical of the two layered lcd panel. But this one has aged darker. It is an even patina, not a netonian ring or decomposition of the polarizer. The second LCD panel is brighter but has three dead segments in Volvo get the dark squares which cover the day symbols and a third segment on the digital display. Initially I thought this was a bad zebra strip cont8nuity but a clean8ng, swapping and testing resulted in no change to the same missing segments so I am sure it is the contact points on the LCD panel itself and not a zebra or PCA fault. That is the LCD panel that works, does so on both PCBs. 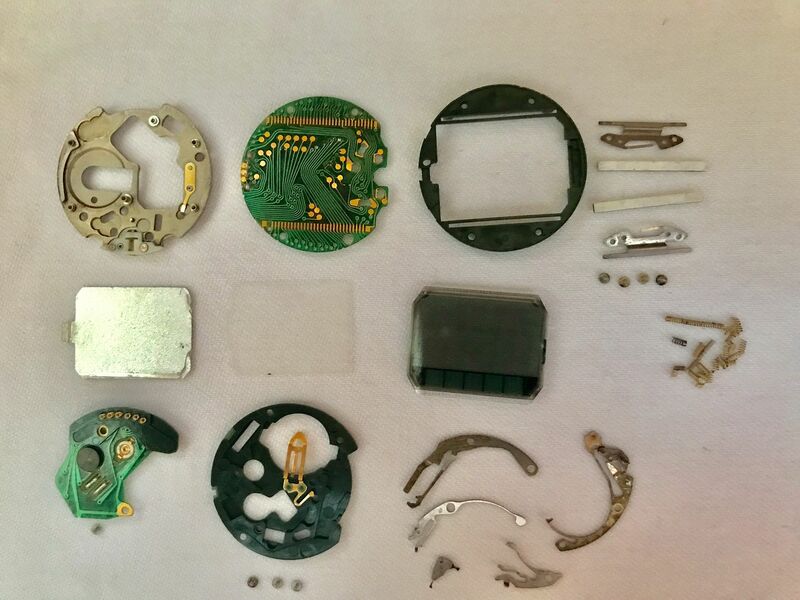 I have a third parts module and case coming and hope that it will supply replacements for the broken switching lever, bad LCD, bad peizos and the scratched crystal will supply a template for a crystal replacement as the crystals are no longer available. I can always improvise on the peizos by cutting a correct shaped one from my spares. And yes this is the holy grail of citizens. I am amazed at its functionality for 83.